Twenty-nine-year-old Johanna Watkins from Minnesota cannot kiss her husband Scott, or even spend time in the same room as him. 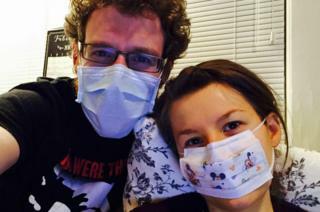 She suffers from Mast Cell Activation Syndrome, a rare disorder of the immune system, which means she is allergic to almost everything, including her husband's scent. Johanna and Scott Watkins's date nights are very different from other couples. "Scott and I will try to watch a show together. We can't be in the room together, because I'm allergic to him, but he will be three floors below me in a room on his laptop and I will be on mine and we'll watch the show at the same time and then text about it as we're watching it," says Johanna. "There were times three and four years ago, before we got the diagnosis, that if I was extra close to my wife, specifically if my face was close to Johanna's face, she would cough," says Scott. "We had noticed that when Scott would come in [to the room] I would start feeling worse and worse. My normal daily symptoms would just be aggravated," says Johanna. "And then at one point he went to get his haircut and came back in the room and within two minutes I had started my anaphylactic symptoms and he had to leave." "It was this horrible reality that it wasn't going to work," says Johanna. "I was now reacting strongly to my husband. Before this I had reacted to my parents, to many, many other people, but it was horrific when it became Scott." The treatment and medication that is usually given to MCAS sufferers does not help Johanna, so at the moment the couple do not know when - if ever - their situation will change. "There's not an easy way around this problem. I want to keep Johanna safe and me going to see her compromises her safety," says Scott. "One of the ways I can take care of her now is by not going to see her. I'm not going to endanger her life. We're absolutely committed to one another and we're going to wait as long as it takes to see if there is some kind of healing." "They don't know if I will get well, and so we hope and we pray that I will," says Johanna. "I have had anaphylaxis, which is a life-threatening allergic reaction, more times than we can keep track of. My life could end quickly. Life is frail - it can end." "On our wedding day we made vows to each other that till death do us part. No matter what life brought. "I can tell you that even if I have this until I'm 90 years old, I would be committed to my husband with that vow and still love him." "I've had to release a lot of what I expected for myself and I've had to accept what has been given to us," says Scott. He adds: "Johanna and I are good at talking, we talk a lot, we try to communicate a lot, so one thing that we've found that's helpful is just bringing each other into what's going on in our lives as best we can because we're not able to be together." Scott works full-time as a teacher and then returns home every evening to cook Johanna's food. "It's one of the ways that I can care for her, and every other day for the past year I've had one of my dear friends come and they help [me] cook for Johanna," he says. "She can only eat two meals, so she's been eating the same two meals for over a year." The couple are currently living in the family home of their friends, the Olsons, while their own home is renovated to make it a safe living space for Johanna. The Olson family have given up using all scented products and do not cook in their house at all. "I have had severe reactions to someone smoking a cigarette down the block," says Johanna. "I have had severe reactions to the pizza place that's a mile down the street, and all my windows are closed and sealed in the room with special filters. "But just if the wind blows it on the right direction that day and I get even a whiff I can have a severe reaction. The house is quite large and I'm at the top level, and if an onion were to be cut in the kitchen I have had a severe reaction." The only people she does not have a life-threatening reaction to are her siblings, who help take care of her. Before they enter her room, they have to avoid eating strongly spiced food, shower with a special soap and strip down to their underwear. As soon as they walk in, they put on masks and special clothes that have never left Johanna's room. Despite all these precautions, Johanna's symptoms still become worse after their visit. "I think growing up in America, it's common for us to just think, 'Oh OK if there's a disease there'll be a medical solution, it will be fixed and I'll move on with my life,'" says Johanna. "So being diagnosed and becoming this ill, [there was] definitely a grieving process that I went through." "I have many gifts in my life, many blessings that I have to be thankful for," she says. "And that reminds me to not become selfish and just make it all about me."